When Friends debuted in 1994, no one anticipated the sensation it would become. Through its decade-long run, the show maintained an uncanny connection to its audience, who saw it both as a reflection of their own lives and an aspirational escape from reality. I'll Be There for You is a deep dive into Friends history and lore, exploring all aspects of the show, from its unlikely origins to the societal conditions that amplified its success. Journalist and pop culture expert Kelsey Miller relives the show's most powerful moments, sheds light on its sometimes dated and problematic elements and examines the worldwide trends that Friends catalyzed, from contemporary coffee culture to the wildly popular '90s haircut The Rachel. 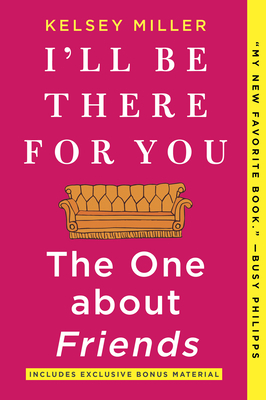 I'll Be There for You is not only for fans of the series, but for anyone who's ever wondered what it is about this show--and television comedy--that resonates so powerfully.